The Newness Advantage | Karmal Books online Christian books and media store. Walking with God should be simple, powerful and deeply experiential. In his new book The Newness Advantage Graham explores the process of being made new in Christ and how we can upgrade our perception and experience of the lifestyle that God calls us to as His people. 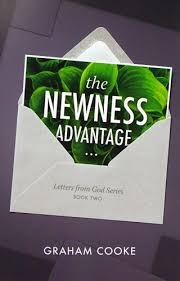 The Newness Advantage is the second book in the The Letters From God series. It follows last years release The Nature of Freedom and both are exceptional, thought provoking development tools, designed to empower you into a dynamic place of relationship with God.